What is Open Street Map and what is HOT ? 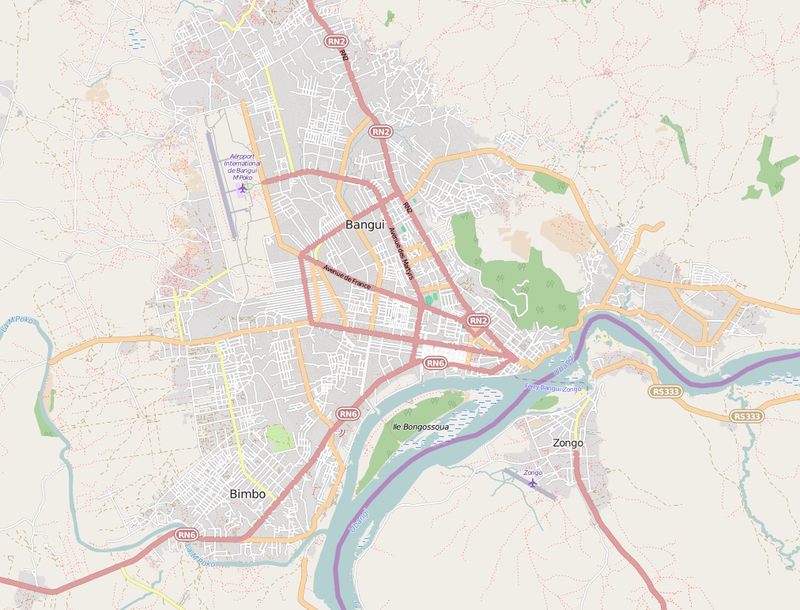 Open Street Map (OSM) is a collaborative project aiming to create a free and open map of the world made by volunteers with GPS images, digitizing aerial imagery and geographic data, in order to fill the gaps in existing mapping data to assist and respond to disasters and crisis situations. HOT stands for Humanitarian Open Street Map Team, bridging the gap between the principles of Open Source and Open Data sharing on the one hand, and the humanitarian responses on the other hand. HOT collects data and evaluates them to determine their quality, usefulness and compatibility with the OSM license. The main goals are to connect humanitarian actors and the open mapping community, in order to enable remote data creation during crisis situations, to collect and organize existing data sources, and to support on-field applications. In December 2012, the Central African Republic was invaded by the Muslim Seleka Rebellion. The capital Bangui then fell into their hands in March 2013 and the situation in the country was declared a Level 3 Crisis by the United Nations. The Humanitarian Open Street Map Team (HOT) was mobilized even before the outbreak of the crisis and the field project continued after violent events started. An official HOT Activation started in order to map the country on a systematic basis, to provide humanitarian actors with the best possible data and to facilitate development projects in view of the post-conflict situation.1 The mapping of the country started in October 2012 with EUROSHA volunteers, a European program promoting Open Source Database. They developed partnerships with different stakeholders who also trained other mappers such as local and international NGOs, UN organizations and Governmental Authorities, before the crisis started. When the Seleka crossed the country from North to South, HOT was activated with a remote mapping of the most affected cities, data coming mainly from UNICEF for health centers and schools, and from the World Resources Institute for the road network and localities. Thanks to this project, more and more cities are now mapped. For example, between January and April 2014, 11 new towns were mapped with the contribution of 115 Open Street Mappers. The next steps aim to complete the mapping of the large Internally Displaced Persons camps although the Refugees Entry Points have already been pinned, the remaining towns, the drinking points from UNICEF and the road network. By the end of 2012, rebel forces called Seleka marched on central and eastern regions of the country. They forced the President François Bozizé to leave power in March 2013 when they marched on the capital city, Bangui, because they considered that the agreements they had with the President – for example the freeing of prisoners, had not been respected.3 Their chief, Michel Djotodia, took the power for ten months after that.4 The Seleka rebels and Michel Djotodia belong to the Muslim minority in the country, and the situation evolved to a conflict between the Seleka coalition of rebel groups and the mainly Christian anti-balaka coalition, supporting François Bozizé. The tensions between the two ethnic groups escalated and the risk of genocide remains high in the country. The shortage of adequate food, water and shelters triggered a humanitarian crisis in the country. Out of 4.6 million people in the country, about one million left their home because of the violence, and 436, 000 people were displaced internally, according to the UN. The report says that 6,000 people died since the beginning of the conflict and 2.7 million, i.e. more than half the population, needs emergency assistance.8 If the conflict continues and the country is not supported by the international community, around 3.45 million people could face food insecurity by the end of the year according to the International Rescue Committee (IRC). The Seleka was pushed out of power and out of Bangui under international pressure and violent actions by the anti-Balaka militias, and Djotodia was forced to resign in January 2014. Catherine Samba-Panza has been acting president since then, but most of crimes committed remain unpunished and the situation is still unstable. At the beginning of May 2015, a reconciliation forum was put in place in the country but the agreements are very fragile and a new outbreak of violence cannot be ruled out. In the country, many public service infrastructures are still missing. As a consequence, it is very useful that an application like Open Street Map starts to map the country and the infrastructures such as health service centers to help with the reconstruction of the country and the management of the post-conflict situation of Central African Republic. These elections are a big challenge for a country fraught with insecurity where ethnic violence still threatens every area. Some parts of the country, particularly the northern and eastern regions, are still under ex-Seleka influence. Elections are an opportunity to rebuild the country and to give hope to the population after the trauma. Humanitarian needs are still huge, and this is why platforms and applications like OSM and HOT are more than necessary, because if elections are a moment of hope, they also can be a very dangerous event, where ethnic and religious groups have hopes and could be disappointed. After an election, ethnic tensions in a country that just witnessed a civil conflict are at the highest, and violence can come back as quickly as it disappeared. The OSM community has shown that it is able to provide an effective and rapid response to a crisis situation, but also to remain active during the duration of the conflict. Thanks to the amount of data now available, more and more humanitarian stakeholders like the UN, large NGOs or Conflict Monitoring studies are using these resources.